A few years ago, while on vacation, our debt card number was stolen. Most likely the number was swiped by a restaurant server utilizing a card reading device. By the next day our debit card number had been used in London for grocery store delivery as well as on several random internet ordering sites. Fortunately we were able to halt further charges; but not before a few checks bounced and experiencing a considerable amount of headache and frustration dealing with the issues while on vacation. After the trip we realized that a debit card was not the safest route to use when traveling. Our debit card gave “bad people” access to all of the money in our checking and savings. There are numerous other reasons to not use a debit card while traveling (especially internationally): Rental car companies and hotels frequently “hold” several hundred dollars while waiting to post final charges. Debit cards usually do not provide additional insurance or protection on certain purchases, rentals, and other travel expenses. Once your debit card has been fraudulently used, your checking account may be put on hold and it takes awhile to get the money credited back into your account. In the meantime, you will not have access to your cash. We decided to get a credit card that worked within our lifestyle. We love to travel and experience local events and restaurants. Looking for a credit card that offered points toward travel and vacations made the most sense to us. Maybe, just maybe, after a few years we would have enough points to pay for an entire vacation. Add up our monthly expenses that could be paid (without a fee) via credit card and apply for a card within that limit. Purchase our groceries and miscellaneous items on the card, as well as pay any bills that did not charge a credit card processing fee. Pay the entire card off at the end of the month. We started researching various credit card options along with their additional offerings, insurance, and travel rewards programs. Here are a few of the top travel cards we found along with a few of their basic terms, perks and rewards. Offers 40,000 bonus miles when you spend $3,000 on purchases in the first 90 days. No Foreign Transaction fees while traveling internationally. $89 per year fee after the first year. Offers 10% Miles back to use toward your next redemption every time you redeem for travel statement credits. Earn 3X points for flights booked directly with airlines. 2X points at US gas stations and US supermarkets. 1X points on other purchases. No interest as this card is set up to be paid off each month. For frequent travelers Amex offers a Platinum card with no foreign transaction fees and access to participating airport lounges (among other perks). $450 yearly fee. Venture One Card® – Earns 2x miles on every purchase, 40,000 Bonus opportunity, $59 yearly fee. No annual fee & provides 1.5x Miles on every dollar you spend. Double Miles at the end of your first year. Refund via statement credit of up to $30 for in-flight Wi-Fi. Earn 1.5 points per $1 spent on all purchases. *Card benefits vary and are subject to change. APR, approval, and other fees based on credit eligibility and other factors for all credit cards. Every credit card company offers versions of rewards cards. It is important to research thoroughly to make sure the card and terms are right for you. 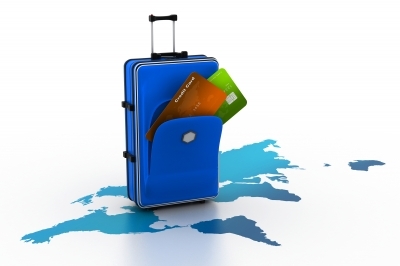 If you don’t travel frequently you may want to opt for a zero yearly fee card. Cards with no fee generally offer points but may not offer as many additional travel perks. We have been utilizing our card as planned for a few years and it has finally paid off. We have accumulated enough points to pay for round trip tickets for our family of four. The key for us is maintaining a limit that does not exceed our monthly expenses and paying the card off promptly each month. We have been very careful not to exceed our monthly budget or carry a balance on our card. I am happy to say that later this summer we will be jetting off to a fabulous (yet to be determined) location and paying for the vacation almost entirely with our credit card travel rewards! We have learned to make our monthly expenses “work” towards future travel for us and hopefully you can too. We have a card that we use for traveling that earns us cash back and other neat things. I rarely use my debit for traveling.Thank you for sharing the tips and sorry that your family had to go through that awful ordeal . There’s excellent information here, especially for traveling families. wow, what a great breakdown of all those cards. We don’t travel as much as I’d like due to my husband’s job so I plan to live vicariously through your blog! I have one card that gives rewards, but I doubt I’d ever get enough points for a free vacation. We have had our card for a couple of years and we only recently obtained enough points to really pay for a vacation. We were able to rack up points by paying all of the monthly bills we could and then sending the bill $$ directly to the credit card. In our case we can pay for our Insurance, property taxes, grocery, auto, & miscellaneous without paying a processing fee. It really ads up fast if you are using it for bills. We are very careful not to carry a balance or make impulse purchases. Thanks for reading! Great idea! We always use our points to help with Christmas. I love American Express, they are so responsive if we ever have a problem. great post!